The National Thoroughbred Racing Association (NTRA) announced today that registration is now open for the year’s first free “NHC Online Challenge,” which will be held Saturday, June 1. The top five finishers in the June 1 online tournament will receive berths in the $1.5 million-guaranteed Daily Racing Form/NTRA National Handicapping Championship, Presented by Sovereign Stable and Treasure Island, Las Vegas (NHC) in January 2014. The five qualifiers also will receive roundtrip air travel and hotel accommodations for their trip to the 2014 NHC. The June 1 ‘”NHC Online Challenge” is the first of four free NHC online tournaments to be held this year. In all, a total of 20 seats to the NHC will be awarded to NHC Tour members qualifying in these free tournaments. Membership ($50) in the 2013 NHC Tour is mandatory to participate in the online tournaments. To sign up for the NHC Tour, visit www.ntra.com/nhctour. The “NHC Online Challenge” requires contestants to place mythical $2 win and place wagers on 10 designated contest races on June 1. The 10 contest races will be posted online by tournament officials on Thursday, May 30. Selections may be made beginning Friday, May 31, after official program numbers have been assigned. Free DRF past performances for the tournament races will be available at the contest site. All selections must be made no later than one minute prior to the scheduled post time of each mandatory race. The five players amassing the highest number of points based on the players’ earnings (i.e. the highest final bankroll) from all mythical $2 win and place wagers at the end of the competition will receive berths in the January 2014 NHC in Las Vegas, provided that they have a paid membership for the 2013 NHC Tour prior to the start of the tournament. Weekly e-newsletter featuring player profiles, recaps of previously held tourneys, schedules and links to upcoming tournaments, etc. For more information about the Daily Racing Form/NTRA National Handicapping Championship, visit www.ntra.com. For further information or questions about the Saturday, June 1 tournament, contact Michele Ravencraft of the NTRA at (859) 422-2657 or via e-mail at mravencraft@ntra.com. 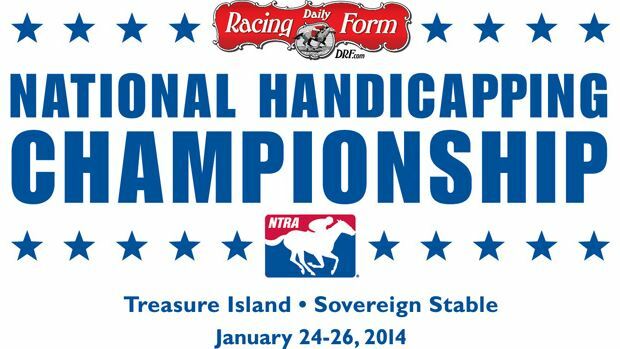 In its 15th year, the Daily Racing Form/NTRA National Handicapping Championship, Presented by Sovereign Stable and Treasure Island, Las Vegas is the most important tournament of the year for horseplayers. There are no “buy-in” entries at the NHC. It is the culmination of a yearlong series of NTRA-sanctioned local tournaments conducted by racetracks, casino racebooks, off-track betting facilities and horse racing and handicapping websites, each of which sends its top qualifiers to the national finals. Each year, the NHC winner joins other human and equine champions as an honoree at the Eclipse Awards. The 14 NHC Champions since the event’s inception, in chronological order, are Steven Walker, Judy Wagner, Herman Miller, Steve Wolfson Jr., Kent Meyer, Jamie Michelson, Ron Rippey, Stanley Bavlish, Richard Goodall, John Conte, Brian Troop, John Doyle, Michael Beychok and Jim Benes.